The most striking aspect of this cabinet is its architectural form, which suggests a building with a steeply pitched roof, tall chimneys and dormer windows (windows fitted vertically into an extension built out from a sloping roof). 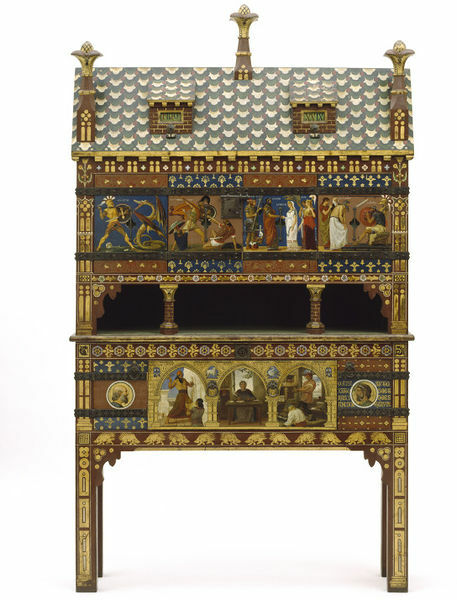 The designer of the cabinet, the architect William Burges (1827-1881), based the design on a combination of two medieval armoires (cupboards), one at Bayeux and one at Noyon (destroyed during the First World War), both in northern France. The cabinet is actually a desk with a writing flap concealed behind the lower panel with painted arcades. The themes of the painted decoration relate to writing and printing. The dormer windows contain calendars for the days of the week and months. The scenes painted by Sir Edward John Poynter (1836-1919) include the story of Cadmus, who was believed to have introduced the alphabet to the ancient Greeks. This was an appropriate choice, as the cabinet was intended to be used as a writing desk. The other scenes, also by Poynter, depict the cutting of cuneiform letters, the medieval Italian poet Dante Alighieri (1265-1321) and the English printer and publisher William Caxton (born about 1427, died 1492). These are all allegories of inscription, composition and publication. The painted decoration also shows heads of figures representing History and Poetry, the ancient Greek philosopher Anaxagoras (about 500-428 BC) and his friend Pericles, ruler of Athens, Greece, in the second half of the 5th century BC. The insides of the cupboard doors are painted with portraits of Poynter and Burges. H.G. 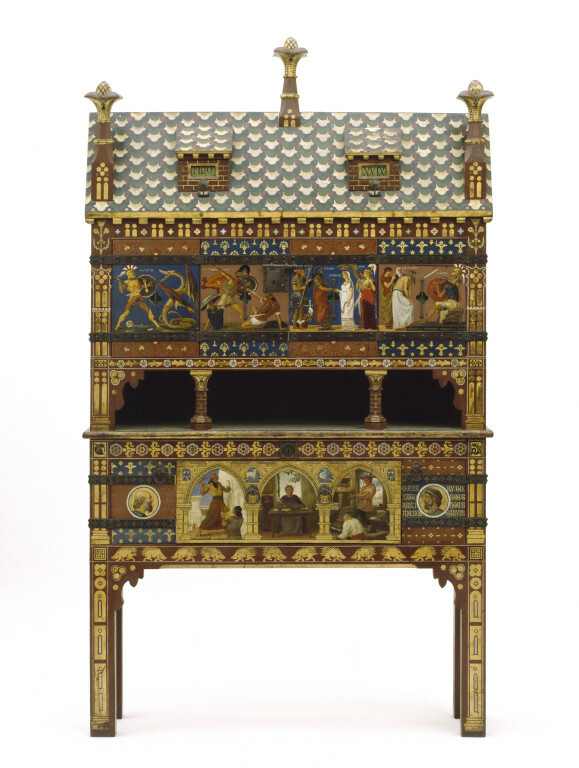 Yatman, who commissioned this cabinet, was the brother of the Reverend John Augustus Yatman (1817-1894), who employed Burges as architect for his house at Winscombe Hill, near Weston-super-Mare, Somerset, and later the church. In 1858 the father of the Yatman brothers died, and they may have inherited substantial sums of money. We do not know how H.G. 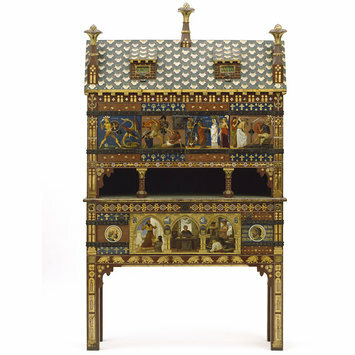 Yatman acquired or developed his taste for avant-garde Gothic Revival furniture at such an early date. However, his sister-in-law's father, W.H. Turner, had been following trends in Gothic Revivalism since the late 1840s. The Yatman Cabinet, pine and mahogany, painted, stencilled and gilded, with metal leaf, lock and hinges of iron, 236 x 140 x 40.5 cm. Wilk, Christopher, ed. . Western Furniture 1350 to the Present Day. London: Victoria and Albert Museum, 1996. 230p., ill. ISBN 085667463X. Designed by William Burges (1827-1881) for H.G. Yatman, 1858, and made by Harland and Fisher, London.